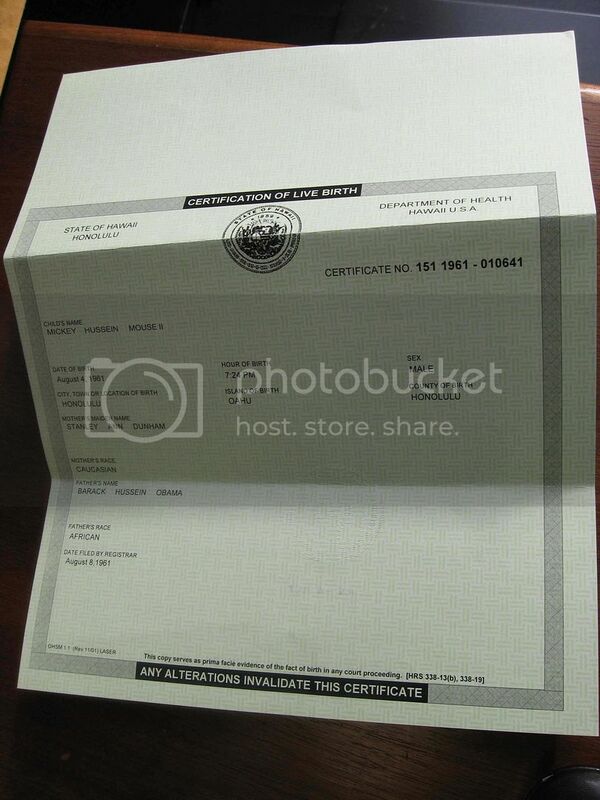 On April 27, 2011, putative President, Barack Obama, released to the public a digital image on the White House web site of his alleged long form Certificate of Live Birth. A majority of Americans have wanted Obama to confirm that he was in fact born in Hawaii. Yet, Obama refers to these concerned Americans as “sideshows and carnival barkers.” But worse than that, the document that Obama has released raises some very serious issues and confirms a critical piece of information. The document published on the White House web site (whitehouse.gov) is not a scan of a paper document but rather was built with computer programming by using many electronic layers. A scanned document only has one layer of information. This document has various electronic layers which raises the serious question of whether the document was obviously forged. A must-see video by infowars.com in which Alex Jones explains how in his opinion this document has been forged may be viewed at http://www.youtube.com/watch?v=3g30VCl_cgk&feature=youtu.be. A big question that the video raises is that this document is so obviously a fake that one wonders whether those who did it are that highly incompetent or did they fake it so badly so as to want to get caught so as to draw attention to it and away from the real issue. For more information on the “document” being nothing more than an electronic manipulation, see http://www.youtube.com/watch?v=7s9StxsFllY ; The Market Ticker at http://market-ticker.org/akcs-www?post=185094; http://www.youtube.com/watch?v=2eOfYwYyS_c (Karl Denninger shows that the Obama BC image is not a scan and concludes the image is a forgery); http://www.thepostemail.com/2011/04/28/dr-ron-polland-evaluates-obamas-birth-certificate/ (Post & Email interview of Dr. Ron Polland); http://www.youtube.com/watch?v=Pgev9a7VDxY&feature=player_embedded. Another possible reason for the obvious forgery is that the creators of the forgery unknown to Obama want Obama to get caught at his big game of deceit. Finally, another possibility for creating such an easily detected forgery is that Obama has the real birth certificate that provides the same information as this forgery. After all, Obama was sure to release to the public correspondence showing how two certified copies of the birth certificate were personally picked up by his personal attorney who flew to Hawaii to get them, paying $10.00 for the first one and $4.00 for the second. This correspondence is also careful to explain how the certificates were obtained from the Hawaii Department of Health. The letter from Loretta J. Fuddy, the Director of the Hawaii Health Department, states: “I have witnessed the copying of the certificate and attest to the authenticity of these copies.” See the correspondence chain at this link: http://global.nationalreview.com/dest/2011/04/27/birth_certificate_correspondence_5da9a1a825978db6b52f335642604a2e.pdf So, they created this forgery to mislead people in thinking that Obama does not have the real birth certificate and to keep the “birthers” screaming for the real document. In the end, he will just show the world that he does have the document and that he was telling the truth all along. But regardless of whatever game Obama is playing, as we shall see below, the real issue is that Obama’s father was not a U.S. citizen and so Obama is not and cannot be a “natural born Citizen.” This is the issue from which Obama cannot hide behind some manipulated computer images. 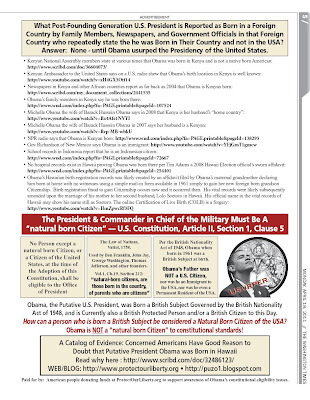 Regardless of whatever Obama is up to with his new-found long form birth certificate, this new document confirms that Obama is not a “natural born Citizen.” A “natural born Citizen” is a child born in the U.S. to a U.S. citizen father and mother. While place of birth is a necessary element of being a “natural born Citizen,” let us not lose sight of the other necessarily element, i.e., a U.S. citizen father and mother at the time of birth. 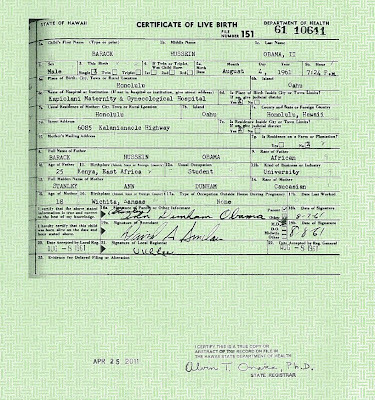 Even assuming this new long form Certificate of Live Birth to be genuine, what is important to understand about this document is that it confirms who Obama’s father is, a fact that has been debated for quite some time. The document shows that his father is Barack Obama Sr., who we know was a British citizen and never became a U.S. citizen. Hence, the document confirms that Obama is not an Article II “natural born Citizen” and is therefore not eligible to be President. Emer de Vattel, The Law of Nations, Sec. 212-217 (London 1797) (1st ed. Neuchatel 1758); David Ramsay, “A Dissertation on the Manners of Acquiring the Character and Privileges of a Citizen” (1789); The Venus (1814) (Marshall, C.J., concurring and dissenting for other reasons); Inglis v. Sailors’ Snug Harbor (1830); Dredd Scott v. Sandford (1857) (Daniels, J., concurring); Slaughter-House Cases (1872); Minor v. Happersett (1875); Elk v. Wilkins (1884); U.S. v. Wong Kim Ark (1898). No amount of computer manipulation or photoshopping can mislead concerned Americans on this score. Federal lawsuit* accuses putative President Obama is fraudulently using a Social Security Number which is legally not his and which was issued only to residents of the State of Connecticut, a state where Obama never legally resided and certainly not during the time frame of circa 1977 when that SSN was issued! This Social Security Number is reserved for the people of Connecticut NOT Hawaii. Obama never lived in Connecticut, and he certainly wasn't living there when the number was issued in 1977, rather he was a 15 year old attending high school in Hawaii. This Connecticut geographic region SSN was used by Obama to register for the Selective Service System. Obama was either in HI or in CA attending Occidental College during his late teens when he was required to file and register with the Selective Service System. Use of this SSN by Obama as recently as the year 2008 has been confirmed by two private investigators - Susan Daniels and Neil Sankey. See the federal lawsuit for more details. *For more information and details on the civil lawsuit against Obama and his Social Security Number see Federal Court Docket Number: 1:11-cv-00402-RCL - Taitz v Astrue, Commissioner of the Social Security Administration. When is Congress going to investigate Obama for all the unconstitutional, nefarious, and illegal activities he is engaged in? Should Enforcing the Constitution and Protecting the Nation Be An Embarrassment? Oklahoma’s SB91, described as “Identity and citizenship - requiring proof of citizenship for candidates,” authored by Senators Brinkley, is now making its way through the Oklahoma legislature. See information on the bill here, http://www.oklegislature.gov/BillInfo.aspx?Bill=sb91. The bill passed the Senate by a vote of 34 yes to 10 no (4 votes were excluded). On April 6, 2011, it passed the House Rules Committee by a vote of 11 yes to 0 no. “Here in Oklahoma, where Mr. Obama won just over a third of the vote in 2008 — one of his worst state losses — Senate Bill 91 passed last month with overwhelming and even bipartisan support. People in both parties said they were confident that the House would do the same by the deadline next week (the bill would have to return to the Senate for a procedural vote). Lawmakers said they assumed that Gov. Mary Fallin, a Republican, would sign it. A spokesman said Ms. Fallin would not comment until the bill was on her desk and she had a chance to review it. Legislators backing credentials bills in other states are closely watching what happens here. Opponents of the birther bills say they are unnecessary and are designed to score political points more than safeguard democracy, certainly in Mr. Obama’s case. Still, Democrats in Oklahoma were divided. For example, the minority floor leader in the House, Chuck Hoskin, said he would probably vote yes. Asked in an interview whether he was concerned about embarrassing the leader of his own party, Mr. Hoskin said he thought Mr. Obama’s failure to win over Oklahomans in 2008 was the real embarrassment. But down the hall, an assistant Democratic floor leader in the House, Al McAffrey, said the bill was the embarrassment. ‘But this is Oklahoma — we embarrass ourselves all the time,’ he said. http://www.nytimes.com/2011/04/22/us/politics/22birthers.html?_r=2&hp. What a sad state of affairs in America. Someone should ask these politicians when it became embarrassing for lawmakers to preserve, protect, and defend the Constitution, which is the oath of office that they all take. When did it become embarrassing to assure the integrity of the electoral process? When did it become embarrassing to restore the faith of the American people in knowing who their President is? Was our media and Congress also too embarrassed to press Obama that he release to the public his documents showing who and what he is and to otherwise properly vet him during the 2008 presidential campaign? Were the courts too embarrassed to accept any one case in which Obama would have to produce discovery and conclusively show that he is a “natural born Citizen?” Did Arizona Governor Jan Brewer tell us that she was too embarrassed to sign the Arizona legislation that would have required presidential candidates to prove their citizenship when she said it was “a bridge too far?” Were our leaders also so embarrassed that they allowed a highly decorated military officer, LTC Terry Lakin, to be court-martialed and go to federal prison for exercising his sense of duty to protect the Constitution? And are our leaders now just too embarrassed to admit that they were simply too embarrassed to properly exercise their duties to the nation and to the American people and adequately deal with Obama? We all know by now that Governor Jan Brewer on April 18, 2011, vetoed Arizona’s historic vetting and eligibility bill that passed both Houses of government. But I have not heard the Governor offer any solution to the problem of assuring the integrity of the state and federal electoral process. Governor Brewer should simply advise the Arizona legislature what her problems are, e.g., she says they are circumcision documentation (just one of the listed documents) in place of a birth certificate should the latter document not be available and the role of the Secretary of State to make sure the candidate meets the eligibility requirements, and ask them to modify the language or take it out of the law. The legislature can then resubmit the bill. That is how simple it is. Governor Brewer also needs to understand that the federal government has not legislated in this area of vetting and confirming eligibility of presidential and vice-presidential candidates for state electoral ballot placement. Hence, at present, some unknown person is de facto fulfilling the role which would be legally given to the states’ Secretary of States. She also needs to understand that the Constitution and case law give the states appropriate powers over the state election process which also necessarily impact on presidential and vice-presidential candidates' ability to be placed on state election ballots. Hence, the federal government has left it up to the states to address the ballot vetting issue and would expect them to do so, provided their vetting means are reasonably in keeping with constitutional eligibility ends which are “natural born Citizen,” age 35 years old, and U.S. resident for 14 years. Governor Brewer also needs to understand how important the Arizona legislation is not only to Arizona but to the rest of the nation. History has shown that when one acts others will follow. Here, vetoing this bill without offering a solution has caused great damage to the efforts of others to bring integrity to the electoral process involving the president and vice-president. The lack of federal law in this area has caused the national constitutional crisis involving putative President Barack Obama II. It is totally irresponsible and contrary to her oath to preserve, protect, and defend the Constitution for Governor Brewer to simply veto this legislation without offering a solution. Governor Brewer and the Arizona Legislature need to get together and iron out the impediments, whether real or imagined, to this much needed legislation. Wash Times Ad: What U.S. President in History Has So Many Sources in a Foreign Country Saying He was Born in Their Country and NOT in the USA? 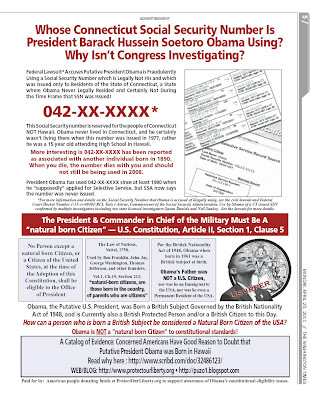 Wash Times Ad: What Post-Founding era U.S. President in History Has So Many Sources in a Foreign Country Saying He was Born in Their Country and NOT in the USA? I recently reported that Arizona has become the first state in the nation to pass a vetting and eligibility bill covering all federal and state candidates for public office, including those vying for the office of President. The bill now goes to Governor Jan Brewer for her signature. If she does not sign it, the bill will also become law. The only way the bill will not become law is if she vetoes it. She has until Thursday to act. I do not agree with Professor Bender. I have covered this issue in my article entitled, The States Have the Constitutional Power to Pass Legislation Prescribing Presidential Ballot Access Requirements Including Determining Whether a Candidate Meets the Eligibility Requirements of Article II, Section 1, Clause 5, which can be read at: http://puzo1.blogspot.com/2011/03/states-have-constitutional-power-to.html. Arizona is not adding any additional standard to the Constitutional presidential eligibility requirement. Rather, it is only enforcing the ones that are already spelled out in Article II, Section 1, Clause 5, i.e., a “natural born Citizen,” 35 years old, and a resident for 14 years. That a candidate presents proof of place and date of birth in order to satisfy the “natural born Citizen” and 35-years-old age requirements is not only reasonable but also necessary and proper. Such a requirement does not change the constitutional standard. In fact, Arizona could also ask for information on the citizenship of the candidate’s parents. Apart that a “natural born Citizen” is a child born in the country to U.S. citizen parents, let us not forget that one of the reasons the U.S. Senate voted in Senate Resolution 511 that John McCain was a “natural born Citizen” is because he was born to U.S. citizen parents. They tell us that the courts have no jurisdiction over the matter. Congress tells us that the courts have resolved the problem, even though no court has ever ruled on the merits of the question but rather dismissed most of the eligibility law suits because of standing. The courts tell us that they have no jurisdiction and that Congress should have resolve the problem and in default thereof the people have to resolve the constitutional question of whether Obama is an Article II “natural born Citizen” in the voting booth. Dr. Chiyome Fukino, the former Director of the Hawaii Department of Health, has recently told us after almost three years that she has seen in the past Obama's real birth certificate. She recently told us exactly where it is located in the Hawaii Department of Health offices. Even though Dr. Fukino knows that the real birth certificate is “located in a bound volume in a file cabinet on the first floor of the state Department of Health,” and despite being the Governor of the State of Hawaii, Abercrombie could not find it when recently he went looking for it. Even Tim Adams, former Hawaii election clerk, said that during the 2008 election campaign, no one could find Obama’s real birth certificate. Hence, no current Hawaii official has seen the real birth certificate and only one person in the whole world has done so in the past. For more comment on Dr. Fukino, see my article entitled, An Analysis of the Current Revelations of Hawaii’s Dr. Chiyome Fukino to NBC News Regarding Obama’s Place of Birth, at http://puzo1.blogspot.com/2011/04/analysis-of-current-revelations-of.html. Hawaii tells us that no one can get a copy of Obama’s real birth certificate, including Obama himself. The reason they give is that Hawaii simply does not provide such copies anymore. 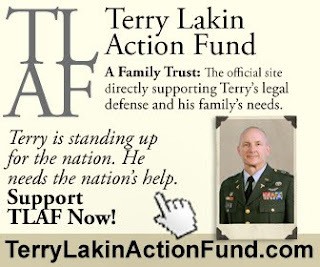 Obama, our Commander in Chief of the Military, would rather send one of his highly decorated military officers, LTC Terry Lakin, who acted out of duty to the Constitution, to federal prison and cause him to lose military career, pay, and pension rather than show his real birth certificate. And let us not forget our illustrious media which has been telling us that Obama has long since released to the world his birth certificate even though Governor Abercrombie and the 2008 election officials could not find it and Dr. Fukino is the only person in the world who allegedly saw Obama’s real birth certificate. Even though the Constitution clearly states that a presidential candidate must be a “natural born Citizen” in order to be eligible to be President, lawmakers in several states have not been able to pass simple, common sense legislation that requires that candidates show proof of citizenship. Now some states like Arizona, which have decided to take the common sense challenge, are attempting to address this issue and constitutional law Professor Bender tells us that what it is attempting to do is unconstitutional because it has added to the constitutional eligibility requirements by having the nerve to ask for proof that the presidential candidate is a “natural born Citizen,” 35 years old, and a 14-year resident of the U.S., which we all know are constitutional eligibility requirements spelled out in Article II, Section 1, Clause 5 of that very same Constitution. And if you should complain about any of this, you are a racist. 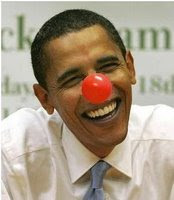 We can thank Obama for making the United States and our leaders the laughing stock of the world. Arizona has become the first state in the nation to pass a presidential vetting and eligibility bill. Yesterday in the Senate at 20-9 and tonight by 40 - 16 (with 4 not voting) in the House of Representatives, the bill was passed. It is now time to start calling Governor Brewer's office. This may need verification, but she has 5 days (possibly as much as 10 but no more than that) to sign it. If she does not sign it at all, the bill becomes law. The only way the bill will not become law is if she vetoes it. The many other states need to follow the lead of Arizona. Contact your state representatives and urge them to follow the lead of the great State of Arizona. Recently we saw an article appear at msnbc.com written by Michael Isikoff, National investigative correspondent for NBC News. 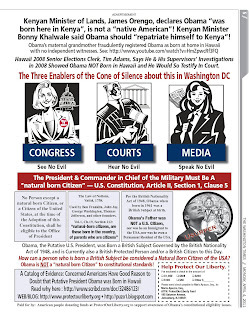 The article is dated April 10, 2011, and is entitled, “Ex-Hawaii Official Denounces ‘Ludicrous’ Birther Claims.” It can be read at: http://www.msnbc.msn.com/id/42519951/ns/politics-more_politics# I will now analyze the many problems that exist with this “investigative” story. My criticisms are directed at both Dr. Fukino and Mr. Isikoff. "The Hawaiian state health official who personally reviewed Barack Obama's original birth certificate has affirmed again that the document is 'real' and denounced 'conspiracy theorists' in the so-called 'birther' movement for continuing to spread bogus claims about the issue. 'It’s kind of ludicrous at this point,' Dr. Chiyome Fukino, the former director of Hawaii's Department of Health, said in a rare telephone interview with NBC. Fukino, sounding both exasperated and amused, spoke to a reporter in the aftermath of Donald Trump's statements on the NBC Today show last week questioning whether Obama has a legitimate birth certificate. Here we see nothing but excuses for not releasing Obama’s long-form, hospital generated birth certificate which I will call his “real birth certificate.” This is not to be confused with a short-form Certification of Live Birth (COLB) dated June 2007 which Obama released on the internet in 2008, which does not contain the name of the birth hospital and the names and signatures of the delivery doctor and other witnesses to the birth. "Contacted by NBC, Fukino expanded on previous public statements and made two key points when asked about Trump's recent comments." Fukino no longer works for the Hawaii Department of Health. Why did Mr. Isikoff not contact the current health department director who overseas the birth certificates in Hawaii? Why do we have to hear from someone who no longer works for Hawaii and no longer has any control over or access to its vital records files? Why can we not hear from the current official who could tell us what is in the file today? "The first is that the original so-called 'long form' birth certificate — described by Hawaiian officials as a 'record of live birth' — absolutely exists, located in a bound volume in a file cabinet on the first floor of the state Department of Health. Fukimo said she has personally inspected it — twice. The first time was in late October 2008, during the closing days of the presidential campaign, when the communications director for the state's then Republican governor, Linda Lingle (who appointed Fukino) asked if she could make a public statement in response to claims then circulating on the Internet that Obama was actually born in Kenya. Before she would do so, Fukino said, she wanted to inspect the files — and did so, taking with her the state official in charge of vital records." Fukino is sure to tell us the exact location of where the real birth certificate was located. She gives us great detail to lend credibility to her story. But she does not tell us who this state official was who accompanied her and whether he or she also saw the real birth certificate. She does not identify any other person who allegedly saw the real birth certificate. One would think that such information would be important and lend credibility to her story. But for some unknown reason, she finds it important to give details of where the birth certificate was located but not that someone other than herself actually saw it. "She found the original birth record, properly numbered, half typed and half handwritten, and signed by the doctor who delivered Obama, located in the files." Why does Fukino tell us that the real birth certificate showed the doctor on it but she fails to tell us that Obama’s birth occurred in a hospital which is what Obama told the public occurred? After all, she knows how much “birthers” have been demanding to see conclusive proof that Obama was born in Kapi’olani Hospital, the hospital in which Obama says he was born. There would be no violation of any privacy laws for her to simply say that he was born in a hospital, without giving the name of the hospital, just like she said that a doctor delivered Obama and signed the birth certificate. What is suspect is that there were numerous doctors at that time who could have delivered Obama but only two hospitals in which he could have been born, Kapi’olani Hospital or Queens Hospital. In other words, the doctors get lost in the shuffle but the hospitals do not. Just saying that a doctor signed the birth certificate does not open up channels of information that can be independently verified. On the other hand, knowing the birth hospital pins down the place of birth to only two specific locations in which there would be contained medical evidence of the alleged birth there. "She then put out a public statement asserting to the document's validity. She later put out another public statement in July 2009 — after reviewing the original birth record a second time." Why did her public statements back then not include the additional information that she is now willing to share with the public? Why has she waited so long to tell us her information? “'It is real, and no amount of saying it is not, is going to change that,' Fukino said. Moreover, she added, her boss at the time, Lingle — who was backing John McCain for president — would presumably have to be in on any cover up since Fukino made her public comment at the governor's office's request. 'Why would a Republican governor — who was stumping for the other guy — hold out on a big secret?' she asked." Why is Fukino theorizing about what a Republican Governor would or would not do? Either Hawaii has or does not have the real birth certificate. If they have the document, there is no need to theorize that the Republican Governor would not go along with any conspiracy. Additionally, Fukino does not say that Lingle ever saw the real birth certificate. So how could Lingle be involved in any alleged “cover up” if she was never privy to any information on the issue? By dragging Lingle into the alleged conspiracy makes it look like Lingle had access to some inside information which she would not fabricate because of her opposition position with the Republican Party. "Her second point — one she made repeatedly in the interview — is that the shorter, computer generated 'certification of live birth' that was obtained by the Obama campaign in 2007 and has since been publicly released is the standard document that anybody requesting their birth certificate from the state of Hawaii would receive from the health department. The document was distributed to the Obama campaign in 2007 after Obama, at the request of a campaign official, personally signed a Hawaii birth certificate request form downloaded on the Internet, according to a former campaign official who asked for anonymity. (Obama was 'testy' when asked to sign the form but did so anyway to put the issue to rest, the former campaign official said." Why should a former campaign official who was involved in a presidential election and who can shed light on this national crisis issue want to maintain anonymity? Should concerned Americans not be able to learn who was intimately involved in handling Obama’s birth certificate? After all, what is the harm to anyone in knowing that information? In 2007, there was no issue regarding Obama’s place of birth. The issue of his place of birth came up in 2008. So how could Obama have been “testy” in having to obtain his birth certificate and for reasons of putting “the issue to rest?” If there was no place of birth issue in 2007 why did Obama allegedly request his Certification of Live Birth (COLB) in 2007 which he did receive and which is dated June 6, 2007 to put to rest a nonexistent issue? Why have we not heard that Obama used that 2007 COLB by sending a copy of it to someone who he thought needed it? We have not heard that he sent a copy of that document to any state election officials to show that he was a “natural born Citizen.” Why did Obama wait a whole year before using the 2007 COLB? "The certification that the campaign received back —which shows that Obama was born in Honolulu at 7:24 p.m. on Aug. 4, 1961 — was based on the content of the original document in state files, Fukino said. 'What he got, everybody got,' said Fukino. 'He put out exactly what everybody gets when they ask for a birth certificate.'" But Fukino fails to tell us who in the Hawaii Department of Health processed in 2007 Obama’s alleged request for a copy of his birth certificate. She does not tell us that she personally looked at the real birth certificate and used it to prepare the COLB. She is only speculating that someone did that. But she does not tell us who would have done that at that time. As the director of that department, she would have known who her employees were at that time. She could have easily identified the employee who prepared the document so that Mr. Isikoff could have done further “investigative” follow up with that person. "Hawaiian officials say that the certification is, in fact, only one piece of abundant evidence of Obama's birth in Hawaii. Joshua Wisch, a spokesman for the Hawaii attorney general's office, noted that a public index of vital records, available for inspection in a bound volume at the Health Department's Office of Health Status Monitoring, lists a male child named 'Obama II, Barack Hussein' as having been born in the state." But this public index only proves that a birth was registered in Hawaii. It is not independent medical evidence of any such birth actually occurring in Hawaii. "In addition, as Factcheck.org and other media organizations have repeatedly pointed out, both of Honolulu's newspapers, the Honolulu Advertiser on Aug. 13, 1961, and the Honolulu Star Bulletin, on Aug. 14, 1961, both ran birth announcements listing Obama's birth on Aug. 4 of that year." The newspaper birth announcements are not evidence of a birth in Hawaii. At best they are evidence that the Hawaii Department of Health put those ads in the newspapers based on a birth being registered as having occurred in Hawaii. The announcements are not the product of a medically verified birth in Hawaii. They do not have a direct link to the birth hospital. "Even Fukino accepts that her comments are not likely to end the matter for the die-hard birthers. Trump and other skeptics have questioned why the original birth certificate has not been released. But Wisch, the spokesman for the attorney general's office, said state law does not in fact permit the release of "vital records," including an original "record of live birth" — even to the individual whose birth it records. 'It's a Department of Health record and it can't be released to anybody,' he said. Nor do state laws have any provision that authorizes such records to be photocopied, Wisch said. If Obama wanted to personally visit the state health department, he would be permitted to inspect his birth record, Wisch said. But if he or anybody else wanted a copy of their birth records, they would be told to fill out the appropriate state form and receive back the same computer generated 'certification of live birth' form that everybody else gets — which is exactly what Obama did four years ago." Fukino attacks anyone who will not be convinced by her story, marginalizing them and casting aspersions toward them. It is rather absurd for Mr. Wisch to contend that someone could not get a certified copy of their own birth certificate, especially the President of the United States. There is no law in Hawaii that so provides. On the contrary, the Hawaii Revised Statutes, Section 338-13(a) states that the department "shall, upon request, furnish an applicant a certified copy of any certificate, or the contents of any certificate, or any part thereof." Paragraph (c) also provides that copies of birth certificates "may be made by photograph, dry copy reproduction, typing, computer printout or other process approved by the director of health." Hence, Hawaii’s statutes directly contradict what Mr. Wisch is telling the public. To further prove that Mr. Wisch is wrong and/or inventing information, we have seen recent examples of people who were born in Hawaii obtain with little fanfare a certified copy of their original long-form, hospital generated birth certificate. A friend of Miki Booth--who was born in Japan, spent much of her life in Hawaii and ran for Congress in 2010 from the Second District of Oklahoma—has a friend who obtained a copy of his long-form, Certificate of Live Birth in March 2011. 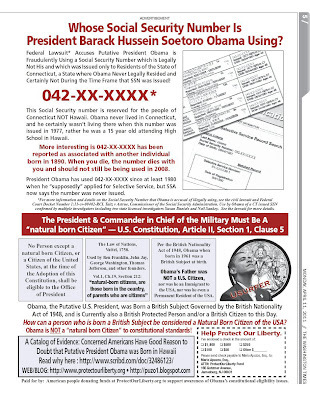 See the story here, http://www.thepostemail.com/2011/04/07/exposing-the-birth-certificate-lies-used-to-cover-for-obama/. Also, October 13, 2010, a “Danae” posted on FreeRepublic a copy of her long-form, birth certificate originally issued in 1969, which she obtained by mail from the Hawaii Department of Health on September 28, 2010 after paying a $10.00 fee. She also posted a copy of the receipt that she got for paying the $10.00 fee. An interesting question is -- where is the copy of Obama's receipt for allegedly ordering a copy of his Certification of Live Birth in 2007? Surely the Hawaiian authorities could release a copy of that. Financial transactions of a government are public information. We know that Governor Abercrombie recently tried to prove that Obama was born in Hawaii. He told the public that he was going to see if he could release Obama’s real birth certificate. Eventually, Abercrombie told the public in a very vague and evasive fashion that he could do no more because of privacy laws. He did say that he found out that Obama’s birth was written down in some state archive. What is strange is that if the long-form birth certificate exists in Obama’s birth file as Fukino is now telling us, why could Abercrombie not tell us the same information that she told us? Why did Abercrombie have to be so evasive and vague about the matter? He could have told us like she did that he went into the health department file and actually saw with his own eyes Obama’s long-form birth certificate and he could have also told us that it contained all the information that Fukino now tells us it contained when she saw it. Abercrombie could have even told us what Fukino left out, i.e., that per the birth certificate, Obama was born in a hospital. Fukino only told us what was in the birth file when she worked there. Abercrombie, as the current Governor, could have told us what is in the file today. That would have been more credible. What is also suspect is that there is no one from Hawaii telling us what is in the health department file today. Rather, Fukino tells us what was in the file in the past. Hearing from someone with official authority tell us what is in the file today would have given the story more credibility given that now Joshua Wisch tells us that today no one can have a copy of the real birth certificate, not even Obama himself, a statement which in itself is incredible and has no basis in law. How convenient can Hawaii get, telling us that at one time the birth certificate was in the file but today no one, not even Obama, is allowed to get a copy of that birth certificate. What Fukino now tells us is contradicted by former Hawaii election clerk, Tim Adams, who has stated and sworn under oath, that he worked in the Hawaii elections office during the 2008 presidential election and that even though Hawaiian election officials searched for Obama’s long-form, hospital generated birth certificate, none could be found. Rather, what was found was a registration and archive notation which sounds like what Abercrombie has told us. It is very suspect that Hawaii tells the public what was in Obama’s birth file in the past but does not tell us what is in the file today. Fukino does not even mention that anyone has inspected the file today to see that those same documents are still in it. Why did Mr. Isikoff no reach out to any current officials in the health department for his story? Such a set up is suspicious, for if access to the file is eventually gotten and the alleged real birth certificate is not in there, Fukino can conveniently say that it was there when she looked and she has no control over what happened to it since she does not work there anymore. What is also suspicious is that Hawaii, using privacy laws as an excuse, will not even release to the public a copy of the documents evidencing someone requested the birth certificate in 2007 and paid for its reproduction costs. This whole article is also very suspect since we do not have direct quotes from Fukino but rather what Mr. Isikoff summarized to allegedly be her statements. Why would the reporter not provide direct quotes to such important statements? So where is the grand conspiracy of which the “birthers” are accused? Based on what Dr. Fukino tells us, there is only one person who has actually seen Obama’s real birth certificate and that is she. Hawaii has not identified any other person who has seen it. So Obama’s nativity story is now held together by only one person, Dr. Fukino. That does not sound like much of a conspiracy story. Why does Obama not want the public to see his real birth certificate or to learn that no real birth certificate exists? 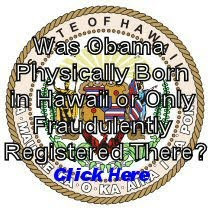 The real birth certificate could reveal information that puts into serious doubt that Obama was in fact born in Hawaii. The absence of a real birth certificate could also put into serious doubt his claim that he was actually born in Hawaii. Or the real birth certificate could contain information that is highly embarrassing to Obama and which could put in jeopardy his life narrative that he has put into the public. Whatever could be the truth of Obama’s problem, the American people whom the President serves are entitled to know which one of those truths it is. Obama’s supporters are proclaiming Dr. Fukino’s recent revelations are the death of the “birthers.” On the contrary, as we can see, what Dr. Fukino has recently said is a far cry from finally resolving the issue concerning Obama’s place of birth. If anything, it just has added more suspicion to the whole story. Donald Trump needs to continue to press forward in his quest to find out what the truth is. Atty Mario Apuzzo and CDR Kerchner (Ret) were on the Peter Boyle Radio Show on KHOW 630 in Denver CO - Tuesday 12 April 2011 @ 9 a.m. EST. The topic will be Hawaii official's lies, intransigence, parsing, and obfuscations as regards their statements about Obama's original vital records allegedly held in their system. Obama's use of a Connecticut SSN issued in 1977 while Obama was never legally domiciled in CT in 1977 (or ever lived there) will also be discussed. In addition they will discuss the lack of constitutional eligibility of the putative president Obama and Obama's unwillingness to provide any hard evidence and certified copy paper documents to controlling legal authorities to back up his "nativity story" and claim of a Hawaiian birth. Factual and legal issues will be discussed. Obama was born to a British Subject foreign national father and Obama himself was thus a British Subject at birth. Obama is not a "natural born Citizen" as is required by the U.S. Constitution Article II, Section 1 for that reason since his father was not a U.S. Citizen, not even an immigrant to the USA, nor even a permanent resident. Obama's birth may have been registered in Hawaii but with the contrary statements coming out of Kenya, and in past years before he ran for President such as these, it is likely that he was not physically born in Hawaii but only falsely registered there as being born in Hawaii by his maternal grandmother after the fact to get her new foreign born grandson U.S. Citizenship using a simple mail-in form available back in Hawaii in 1961. The false registration of his birth would account for the short-form certification of live birth record and the 1961 newspaper accounts of the birth being registered with the Hawaiian Health Department which placed those public service announcements in the weekly papers for all birth registered, real or falsified. 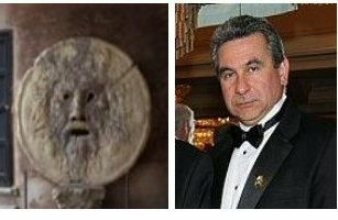 See Atty Mario Apuzzo's "Catalog of Evidence" for and against Obama's claimed Hawaiian birth nativity story. Obama Not Born in Hawaii per Kenyan Assemblymen James Orengo and Bonny Khalwale and Hawaii 2008 Elections Office Official Tim Adams - 04 April 2011 issue Washington Times National Weekly edition - page 5. Obama may be a Citizen, but he is NOT a "natural born Citizen" of the United States to constitutional standards. Obama is not Article II constitutionally eligible to be the President and Commander of our military. Obama is NOT a "natural born Citizen" to constitutional standards. Obama's father was NOT a U.S. Citizen. Obama's father was not an immigrant to the United States. Obama's father was a foreign national, a British Subject. Obama is the child of an alien father who was sojourning in the U.S. attending college. Obama was born a British Subject via his father and is still such to this day. Obama has never conclusively proved he was born in Hawaii. Obama's paternal family in Kenya, Kenyan government officials, and newspapers in Kenya say he was born in Kenya. Obama's maternal grandmother likely falsely and illegally registered him as born in Hawaii to get him, her new foreign-born grandson, U.S. Citizenship. Also, two U.S. Senators although popularly elected and sworn in to the U.S. Senate were subsequently removed from office after it was learned that they were NOT constitutionally eligible when they were elected. Thus it is very clear that winning a popular election does not trump or nullify the constitution of a state or the U.S. federal constitution. Obama is not constitutionally eligible to be the President and Commander in Chief of the military and should be removed from office and his election, confirmation, and swearing in annulled. Topic: The continuing Obama presidential constitutional eligibility issue and LTC Terry Lakin's court martial and imprisonment due to his stand and effort in 2010 to get to the truth about Obama's hidden long-form birth documents and to live up to his commissioned officer's oath to support and defend the U.S. Constitution against all enemies foreign and domestic. Hollywood celebrity journalist/radio host, Mike Evans, has known now Governor of Hawaii, Neil Abercrombie, for decades. He first met the Governor when the Governor was driving a cab in Honolulu, Hawaii. They became good friends. They spent a lot of time together in Washington during the time of Obama’s inauguration. Abercrombie told Evans then that he was going to run for Governor of Hawaii. He also told Evans that he remembered Obama as a child and that he used to call him Barry. He told him that once he became Governor, he was going to put an end to the story that Obama was not born in the United States by getting a copy of his birth certificate. Abercrombie did become Governor and using his powers as Governor, he did look for the document. On January 19, 2011, Abercrombie told Evans during a telephone conversation that he searched everywhere for the birth certificate. He told him that he went to the only two hospitals that existed in Honolulu at the time at which a baby could be born, Kapi’olani Women’s and Children’s Hospital and Queen’s Hospital. Abercrombie told him that there is no Obama birth certificate in Hawaii and that there is absolutely no proof that Obama was born in Hawaii. Abercrombie also told Evans that he remembered Obama playing in a tee-ball league when he was about 5 or 6 but not before that. A confirmation of this information can be heard on a recording of an interview on the radio 92 KQRS Morning Show done on January 20, 2011. During this radio show, Mike Evans, recounts the details of his conversation he had with Governor Abercrombie just the day before. A story on this new revelation and the radio interview can be heard at http://obamareleaseyourrecords.blogspot.com/2011/01/hawaii-hollywood-reporter-mike-evans.html. A full bio on Mike Evans can be seen at http://www.evansradio.com/mikestory.html. Governor Abercrombie then announced that he could do not more to prove Obama was born in Hawaii because it is against state law to release private documents such as his birth certificate. See the story here http://www.staradvertiser.com/news/breaking/114401004.html. The question now is if Abercrombie has not been able to find any Obama Hawaii birth certificate, why did he tell the public that he was abandoning his search for it because privacy laws prohibit him from disclosing the document? Let’s grant to Abercrombie that his efforts were thwarted by privacy laws. But what I do not understand is why he did not simply obtain Obama’s consent for the release of the birth certificate. After all, Abercrombie said that he was a friend of Obama's parents and knew him as a child. What I also do not understand is why Abercrombie, who was so concerned about honoring Obama’s parents and the 2012 presidential election would give up on his quest so easily just because he cannot get the birth certificate released. Is the birth certificate the only piece of evidence that could prove or disprove an Obama Hawaiian birth? What happened to talking to family and friends from 1961 about an Obama birth in Hawaii? Is there no doctor, nurse, family member, friend, or official who remembered the Obama birth in Hawaii and could give Abercrombie confirming evidence of a Hawaiian birth? Abercrombie said that he was a friend of Obama's parents and knew him as a child. Why could Abercrombie not find any other evidence of an Obama birth in Hawaii? With the resources of the Governor’s Office and the publicity generated by this story, how could the Governor not find one person on the whole island of Hawaii or even from the mainland who could confirm with any real evidence that Obama was born in Hawaii? "I, Dr. Chiyome Fukino, Director of the Hawaii State Department of Health, have seen the original vital records maintained on file by the Hawaii State Department of Health verifying Barack Hussein Obama was born in Hawaii and is a natural-born American. I have nothing further to add to this statement or my original statement issued in October 2008 over eight months ago." As we can see, Dr. Fukino, a medical doctor, did not mention anything about the most compelling and probative evidence of a birth event, to wit, medical evidence. As I have reported in my May 6, 2010 article entitled, A Catalog of Evidence - Concerned Americans Have Good Reason to Doubt that Putative President Obama Was Born in Hawaii , Section 338-5 of the Hawaiian statute provides: "§338-5 Compulsory registration of births. Within the time prescribed by the department of health, a certificate of every birth shall be substantially completed and filed with the local agent of the department in the district in which the birth occurred, by the administrator or designated representative of the birthing facility, or physician, or midwife, or other legally authorized person in attendance at the birth; or if not so attended, by one of the parents. The birth facility shall make available to the department appropriate medical records for the purpose of monitoring compliance with the provisions of this chapter. [L 1949, c 327, §9; RL 1955, §57-8; am L Sp 1959 2d, c 1, §19; HRS §338-5; am L 1988, c 149, §1]." Obama alleges he was born in Kapi'olani Maternity & Gynecological Hospital, now called Kapi’olani Medical Center for Women and Children. At no time during the ongoing public debate about whether Obama was born in Hawaii has any official from Hawaii at least informed the pubic that Obama's alleged vital records show that his birth certificate from 1961 was "completed and filed" with the health department in Honolulu by some official of that hospital or a physician or midwife associated with that institution. If Obama was born in a hospital as he claims, we cannot reasonably believe that his birth certificate would have been completed and filed by one of his parents. Additionally, under this statute, Hawaii has the power and authority to obtain medical records from Kapi'olani Medical Center to confirm Obama's alleged Hawaiian birth. At no time did Hawaii inform the American public that it in fact confirmed with that hospital that Obama was in fact born there which it can do under the cited statute. Hawaii has withheld this underlying evidence from the public. This withholding of evidence is a grave matter given that there exists such reasonable doubt as to whether Obama, the putative President and Commander in Chief of our military might, was in fact born in Hawaii. Under Section 338-5, any birth certificate has to be completed and filed by some institution (hospital) or person (doctor, midwife, or parent). This statute also shows that Hawaii has the authority to confirm any reported birth by examining medical records. While Hawaii pretends to have come clean with the American public, it did not even provide such basic information or conduct such due diligence regarding extant medical evidence which would give the public that needed assurance that Obama's birth record is genuine. With the State of Hawaii having such authority under Section 338-5 to confirm through medical records that a birth in fact occurred in a Hawaiian hospital, why did Abercrombie not confirm for the American people that the Obama birth file in Hawaii in fact shows that his birth event is corroborated with medical evidence from Kapi’olani Medical Center as is required by Section 338-5? Are we to reasonably believe that there exists no medical evidence confirming Obama's birth in Hawaii that Governor Abercrombie can share with the American people? We will know what the underlying evidence is about Obama's alleged birth in Hawaii only if we can examine Obama's contemporaneous birth certificate from 1961, the long-form, hospital generated birth certificate, which should be readily available since Obama claims he was born in Kapi'olani Medical Center in 1961. That root document will tell us the name of the hospital in which he was born and the name of the doctor or midwife who delivered him. Those pieces of information are highly corroborative of the place and time of birth, for they provide a whole other dimension of contemporaneous facts that would support Hawaii's or anybody else's bare statement as to the place and time of Obama's registered birth. Governor Abercrombie, you really need to do better for the majority of American people who want and are entitled to see credible and convincing proof of where Obama was born.